A key part of this installation are empty bottles that could be filled by the visitors of the Arte+Faith exhibition at the Catholic World Youth Days in Madrid (15-21 August, 2011) with memories of their beloved dead using any mementos they have brought with them. Paper and pen are provided to fill in: In loving memory of _____________. Next to these bottles stand cast polyresin statues of angels molded from an old and worn-out statue of an angel with broken wings I salvaged from a demolished cemetery in the Philippines. Afterwards it was turned into a housing complex for the poor near our parish. Each statue will be covered with envelopes with intentions for the dead. The installation finds its origin in the devotional practice of faithful Catholics to remember their departed loved ones, which takes place on November 2 on the feast of All Souls Day. As Catholic believers we believe in the communion of the living and the dead, which means that we pray for each other. For me as a Jesuit priest it indicates that I offer the mass to God as an act of devotion and prayer for both the living and the dead. For me as an artist the installation provided a venue to investigate how this form of art interacts with a Christian devotional practice. It also probed into the potential of employing art in ministry, whereby art does not only display a beautiful form but also becomes an image that opens a window for spiritual encounter and enrichment. I hope the bottled memories will provide people with an opportunity for catharsis, a venue for reliving memories and for keeping the legacy of the dead alive. 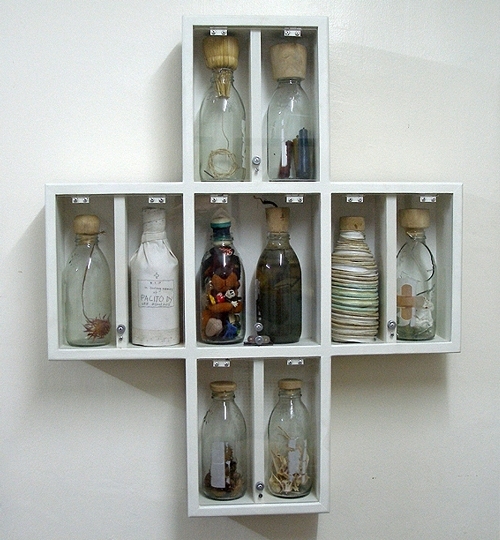 Jason K. Dy, SJ: Installation of bottles with memorabilia of the dearly departed, mixed media, 2010. Jason K. Dy, SJ (b. 1977, Philippines) was artistically inclined when he was young, but it was only when he was in high school that he started to develop his talents by joining art contests, making liturgical designs for communal worship and following art workshops. His art blossomed fully when he joined the Jesuits, who encouraged him to attend art workshops, art classes and conferences, accept book projects (e.g. illustration and lay-out), create logos for institutions, visit exhibitions, participate in art groups and integrate art into his studies in theology. As a priest, he is now not only active in art production but also in art management and pastoral ministry for artists. Jason Dy has explored various art forms such as drawing and illustration, graphic art, mixed media and collages, photography and digital art, so that he could employ various media to communicate his message. In this way his approach to art has always had a conceptual slant, which was reinforced even more by his philosophical and theological training. Only recently he is seen as a conceptual artist in his country. Even though there is a strong conceptual tradition in the Philippines, he came to his own conceptual works through the influence of the social realist movement in his country to which most of his artist friends belong. Through them he learned about installation and community-based art. While there is a preference for figurative and realistic art among church people in the Philippines, his bottled memories art project has been well received.